Vamousse is uniquely a mousse product, allowing quick and precise application to make the process easier, especially when treating children. Vamousse is non-toxic and pesticide free, and safe for children 2 years and older. Vamousse is up to 100% effective with application and combing. 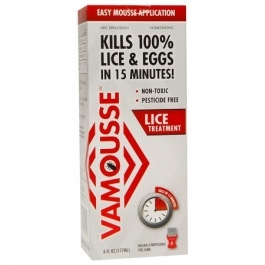 Vamousse Lice Treatment kills lice and their eggs in 1 treatment. To facilitate application, separate hair into 3-4 sections. Shake can well before using. Apply thoroughly to DRY hair. Pay special attention to nape of neck and behind ears. Thoroughly saturate all hair and scalp. All lice and nits must come in contact with the product. After hair is saturated, allow product to remain on hair for 15 minutes. To remove lice and their eggs (nits): Use enclosed lice/nit comb, combing hair from as close to the scalp as possible to the end of the hair. If hair dries during combing, apply more product. After combing, thoroughly recheck for lice/nits. Repeat combing if necessary. Shampoo and towel dry hair. Product may be used as often as needed. Children under 2 years old: Ask a doctor.